This day in which I will bless oils that bring strength, soothe and heal, oils that can be a source of Christian gladness and hope to all those anointed, is an opportune time for me to share with you an endeavor our diocese is beginning that, I believe, will be a source of strength, comfort, healing and of gladness for others and for ourselves. This initiative will be one of Solidarity in Faith. The Lord has anointed me and sent me… As members of the universal Church, we are called to live in global solidarity with all our Christian sisters and brothers. So many are hurting and we are untouched by their suffering. Yes, we see the news and feel badly, but then go about our daily routine. It all seems so overwhelming. We feel helpless. We shrug our shoulders and wonder: “What can I do?” It all seems so far away. Particularly in the Middle East, the birthplace of our Savior and home to the beginnings of our Church, Christians are experiencing an ‘ecumenism of blood’ where our sisters and brothers in faith are under constant pressure to abandon their land, even their faith—or die. The decrease in the Christian population in the Middle East is staggering. If nothing changes, soon there will be no Christians left residing in the most ancient of Christian places. Genocide is happening in our midst. Solidarity in Faith is our practical diocesan response to the Holy Father’s call to assist these suffering families and communities. The Diocese of Ogdensburg is setting out on a “twinning relationship” with the Diocese of Latakia, located in Syria. I have been in contact with Bishop Antoine Chbeir who shepherds this Maronite Catholic Diocese of about 45,000 Catholics that has thirty parishes, 27 priests and 27 consecrated religious. You, perhaps, recall that our much-loved Fr. George Maroun was also of the Maronite Rite. 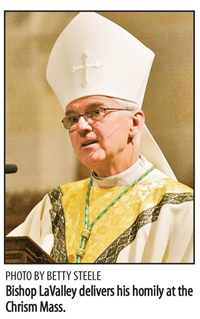 In my email to him, I told Bishop Antoine of my desire to lead the faithful of Ogdensburg to a deeper appreciation of the remarkable faith of people who suffer so much for giving witness to the same faith as ours. The media does not and cannot tell the whole story. This is an endeavor to heighten awareness among the faithful of our diocese of the plight of Christians in the Middle East and a tangible means for us to offer prayerful support and material assistance, while learning about the richness of the Syrian culture and of their strong, inspiring faith. War has wreaked havoc there. Bishop Antoine wrote, “we…had two car bombs and three suicide attacks for the last seven months or so.” Many displaced families have sought safe refuge. There are hundreds of thousands of displaced Syrians. Some arrive with nothing but their pajamas. This Syrian diocese has set up relief programs that try to provide them with clothes, shelter, shoes, mattresses, covers, assistance for medications, food, sanitary items, milk and diapers. Bishop Antoine says that he could narrate hundreds of stories of truly desperate and terrified families approaching him and the Church for assistance. I have asked Father Steve Murray to chair an advisory committee that has been established which will provide concrete ways for the faithful of our diocese to learn about the richness of the culture of the Diocese of Latakia and the gift of the strong faith of those who suffer so much. We hope to share the story of the Syrian people with the students in our Catholic schools, Christian Formation classes, and Youth Ministry groups, as well as our parishioners. We will rely on various social media to help us grow in our knowledge of the Church of Latakia and their inspiring faith story as our relationship grows. 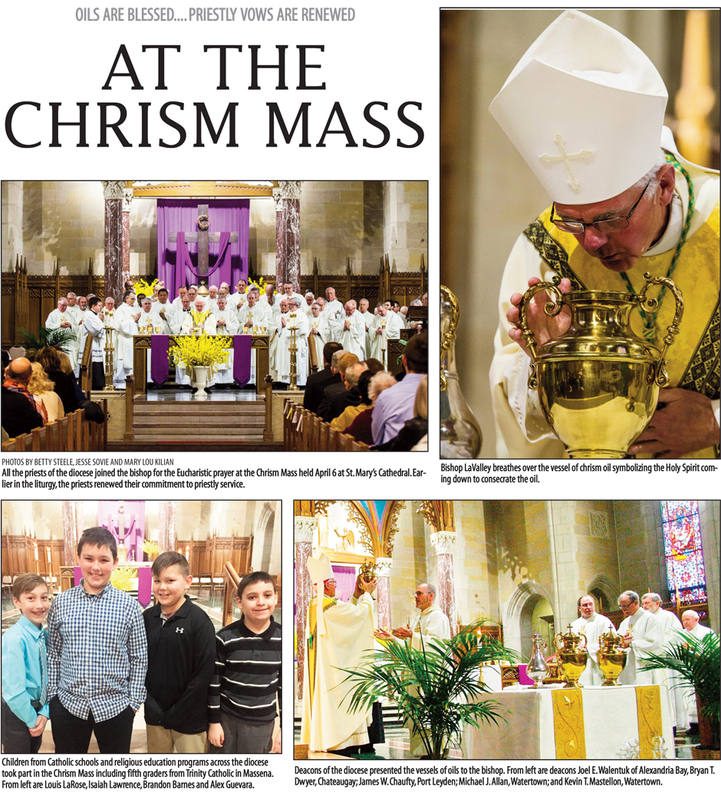 “The Lord has anointed me and sent me…” Partnering with the Diocese of Latakia is certainly a new venture for the Diocese of Ogdensburg. It is, of course, only one means in which this local Church, this anointed People of God, go out to our sisters and brothers in need. As Pope Francis wrote: “Forced migration of families, resulting from situations of war, persecution, poverty and injustice, and marked by the vicissitudes of a journey that often puts lives at risk, traumatizes people and destabilizes families.” (The Joy of Love, 46) As you know, our local Catholic Charities has been a lifeline of assistance to the stranger in our midst—the immigrant and refugee, the materially poor, the frightened, the hopeless. Our continuing prayers and welcoming hearts provide the spiritual comfort and help with the healing for which so many yearn. As we prepare for Easter, our sense of communion in the suffering and risen Christ moves us to pray for this new initiative, Solidarity in Faith. Each of us shares in a unique way in the consecration of Jesus Christ, the Anointed One. I am so grateful to you, my brother priests, who will now renew your priestly commitment at this Mass. Your pastoral leadership, love for God’s people, and zeal for souls serves to inspire us all to be instruments of healing, comfort, of gladness, peace, and hope for all God’s children. May God be praised…forever may God be praised!